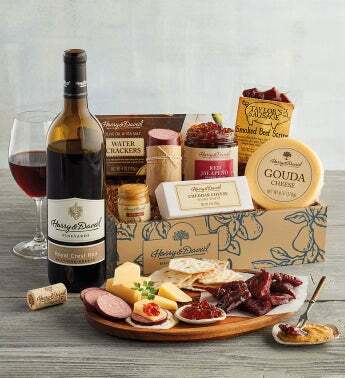 The perfect gourmet snack box and wine gift, our Summer Snacking Gift Box with Wine will surely satisfy spicy cravings with fiery hot sauce and honey hot mustard and delight with our premium hickory-smoked summer sausage. Adding richness and texture to this savory treat, we've included quality white sharp cheddar cheese, flavorful smoked beef strips, and crispy olive oil and sea salt crackers, all great for creating a mouthwatering spread. Quench your thirst after a few spicy bites with our exquisite Harry & David™ 2014 Royal Crest Red Blend. This assortment of amazing appetizers is a wonderful gourmet food gift for anyone who loves an outdoor summer snack.